Poco más de una semana después del NBA Draft, las franquicias ya se encuentran inmersas en apuntalar su plantilla de cara a la próxima temporada a través de la agencia libre. 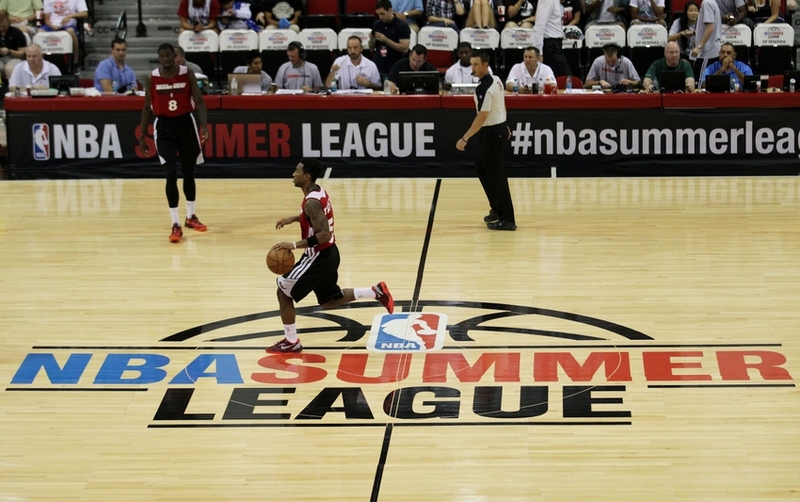 Una buena forma de incorporar jugadores a muy bajo costo es viéndoles jugar en las ya tradicionales NBA Summer Leagues que arrancan hoy y que se disputan durante las próximas semanas, donde muchos novatos universitarios buscarán formalizar su primer contrato como profesional en la NBA. Atlanta Hawks: Jaylen Adams (St. Bonaventure), Kevin Huerter (Maryland), Robert Johnson (Indiana), Jock Landale (St. Mary’s), Junior Robinson (Mount St. Mary’s), Brandon Sampson (LSU), Zach Smith (Texas Tech), Omari Spellman (Villanova) y Trae Young (Oklahoma). Boston Celtics: Justin Bibbs (Virginia Tech) y Robert Williams (Texas A&M). Brooklyn Nets: Bryant Crawford (Wake Forest), Tyler Davis (Texas A&M), Jordan McLaughlin (USC), Theo Pinson (North Carolina) y Yuta Watanabe (George Washington). Charlotte Hornets: Miles Bridges (Michigan State), Chris Cokley (UAB), James Demery (St. Joseph’s), Gabe DeVoe (Clemson), B.J. Johnson (La Salle), Ben Lammers (Georgia Tech), J.P. Macura (Xavier) y Demetre Rivers (Mercer). Chicago Bulls: Wendell Carter Jr. (Duke), Chandler Hutchison (Boise State) y Donte Ingram (Loyola-Chicago). Cleveland Cavaliers: Vladimir Brodziansky (TCU), Bonzie Colson (Notre Dame), Dakota Mathias (Purdue) y Collin Sexton (Alabama). Dallas Mavericks: Josh Adams (Wyoming), Kostas Antetokounmpo (Dayton), Jalen Brunson (Villanova), Duop Reath (LSU) y Ray Spalding (Louisville). Denver Nuggets: Hayden Dalton (Wyoming), Victor Sanders (Idaho), Andre Spight (Northern Colorado), Thomas Welsh (UCLA) y Kenrich Williams (TCU). Detroit Pistons: Bruce Brown Jr. (Miami), Khadeen Carrington (Seton Hall), Obi Enechionyia (Temple), Scottie Lindsey (Northwestern) y Khyri Thomas (Creighton). Golden State Warriors: Elijah Brown (Oregon), Xavier Cooks (Winthrop), Marcus Derrickson (Georgetown), Jacob Evans III (Cincinnati), Keenan Evans (Texas Tech), Jordan Howard (Central Arkansas), Kendrick Nunn (Oakland), Nuni Omot (Baylor) y Jeff Roberson (Vanderbilt). Houston Rockets: Deng Adel (Louisville), Gary Clark II (Cincinnati), Trevon Duval (Duke), Vince Edwards (Purdue), Shannon Evans II (Arizona State), Rob Gray (Houston), De’Anthony Melton (USC) e Isaiah Wilkins (Virginia). Indiana Pacers: Aaron Holiday (UCLA), Alize Johnson (Missouri State) y Elijah Stewart (USC). L.A. Clippers: Bogdan Bliznyuk (Eastern Washington), Ángel Delgado (Seton Hall), Shai Gilgeous-Alexander (Kentucky), Jerome Robinson (Boston College) y Desi Rodriguez (Seton Hall). L.A. Lakers: Joel Berry II (North Carolina), Jeffrey Carroll (Oklahoma State), Nick King (Middle Tennessee), Sviatoslav Mykhailiuk (Kansas), Malik Newman (Kansas), Moritz Wagner (Michigan) y Johnathan Williams (Gonzaga). Memphis Grizzlies: Matthew Butler (Tennessee-Martin), Jevon Carter (West Virginia), Markel Crawford (Ole Miss), Demetrius Denzel-Dyson (Samford), Brandon Goodwin (Florida Gulf Coast), Jaren Jackson Jr. (Michigan State), Terry Larrier (UConn), William Lee (UAB), Anas Mahmoud (Louisville) y E.C. Matthews (Rhode Island). Miami Heat: Dikembe Dixson (UIC), Matt Farrell (Notre Dame), Daryl Macon (Arkansas), Yante Maten (Georgia), Duncan Robinson (Michigan) y Justin Tillman (VCU). Milwaukee Bucks: Jordan Barnett (Missouri), Trae Bell-Haynes (Vermont), Donte DiVincenzo (Villanova), Brandon McCoy (UNLV) y Jae’Sean Tate (Ohio State). New Orleans Pelicans: Trevon Bluiett (Xavier), Tony Carr (Penn State), Dwight Coleby (Western Kentucky), D.J. Hogg (Texas A&M), Bryant McIntosh (Northwestern) y Roddy Peters (Nichols State). New York Knicks: Kevin Knox (Kentucky) y Allonzo Trier (Arizona). Oklahoma City Thunder: Hamidou Diallo (Kentucky), Devon Hall (Virginia) y Kevin Hervey (Texas-Arlington). Orlando Magic: Braian Angola-Rodas (Florida State), Mohamed Bamba (Texas), Jacobi Boykins (Louisiana Tech), Melvin Frazier Jr. (Tulane), Tyler Rawson (Utah) y Kendall Stephens (Nevada). Philadelphia 76ers: David Cohn (William & Mary), Norbertas Giga (Jacksonville State), Tra Holder (Arizona State), Shake Milton (SMU), Landry Shamet (Wichita State) y Zhaire Smith (Texas Tech). Phoenix Suns: DeAndre Ayton (Arizona), Mikal Bridges (Villanova), George King (Colorado), Emmett Naar (St. Mary’s) y Tai Odiase (Illinois-Chicago). Portland Trail Blazers: Gary Trent Jr. (Duke) y MiKyle McIntosh (Oregon). Sacramento Kings: Marcus Foster (Creighton), Allerik Freeman (NC State), Daxter Miles Jr. (West Virginia), Cameron Reynolds (Tulane), Marvin Bagley III (Duke) y Wenyen Gabriel (Kentucky). San Antonio Spurs: Drew Eubanks (Oregon State), Tommy Hamilton IV (Texas Tech), Chimezie Metu (USC) y Lonnie Walker IV (Miami). Toronto Raptors: Rawle Alkins (Arizona), Giddy Potts (Middle Tennessee) y Andrew Rowsey (Marquette). Utah Jazz: Peyton Aldridge (Davidson), Grayson Allen (Duke), Isaac Haas (Purdue), Jairus Lyles (UMBC), Kelan Martin (Butler), Matt Mobley (St. Bonaventure), Zach Thomas (Bucknell) y Thomas Wilder (Western Michigan). Washington Wizards: Troy Brown (Oregon), Chris Chiozza (Florida), Tiwan Kendley (Morgan State), Doral Moore (Wake Forest) y Ajdin Penava (Marshall).